Q: I don't see my gun on your list. Can you still make a grip for me? A: Yes, with your use of a caliper and camera phone to take a few basic measurements of the gun, in almost all cases I can make a grip to fit your gun. Q: How easy is it to alter the grips once I get them? A: Both the PLA and wood composite material sands, files and takes putty just like wood grips. The grips are not solid, but printed with a 2.4 to 4 mm shell over a honeycomb matrix. However, even if your alternations end up penetrating the shell, you won't impact the strength of the grip as this material is very strong. See my Grip Finishing page for more details, pictures and techniques you can apply to your grips. Q: How do I measure my hand for a custom grip? A: Go to the "Custom Measuring" page linked at the top of this page for a complete description of how to measure for your custom grip. Q: Can you put my favorite X grip on my favorite Y gun? A: Yes, with a few exceptions, I can put some version of just about any grip or hand size on just about any gun. Grips for very small hands on very large frame guns are possible, but not always very attractive. I have one very small shooter on my team who uses a cross-eye dominant SW41 grip that looks more like a grip sleeve than a grip, but that is what her hand calls for. Q: Can I get a grip made in my favorite color? A: Yes, as long as it's not bright blue. Though I keep black and pewter PLA in stock, dozens of other colors from hot pink to glow in the dark green are also available for a small fee. To see a few examples, click here. Go to Amazon and search "PLA filament" for options. I don't print grips in bright blue as that is a color reserved for training guns. Q: Can you make a custom this or that for my gun? A: I've made front and rear sites, barrel weights, trigger shoes and other miscellaneous small parts. If you've got an idea or a need some special piece, or short run of something, drop me a note and we'll figure out how to do it. Q: How much do your grips weigh? A: On standard pistols my grip are usually a little lighter than wood grips. On air pistols, I like to bring their weight up to at least what a factory grip would weigh, if not more, unless the customer requests otherwise. Air pistols are notoriously nose-heavy and making sure there is sufficient weight in the grip helps the balance. However at the end of the day, I can easily make any grip just about any weight you want. 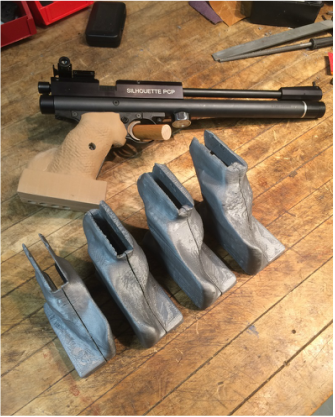 I use a series of holes and .38 slugs in the bottom of the grip which you can adjust at any time to your preference if you are concerned about needing additional weight. Q: Can you compensate for cross-eye dominance? A: Yes, by off-setting the gun in the grip 6 degrees you will be able to take a much more comfortable shooting stance to accommodate your right handedness and left eye-ness. Or vice versa. Q: Do you offer discounts for schools and clubs? A: Yes, orders of three or more grips receive a 15% discount. Q: Can you put my name and or team graphic on the grip? A: Yes. Here are a few examples. Q: What if I'm not happy with my grip? A: If you're not completely satisfied with your grip, I'll gladly remake it to your liking, or completely refund your money. A: I accept credit and debit cards, PayPal or checks. Contact me at PrecisionTargetPistolGrips(AT)gmail.com if you have questions.